Fox News did not air several speeches from the 2016 Democratic National Convention that focused on gun violence, equality, immigration, national security, and reproductive rights. Here are some of the speeches they ignored. Cable news outlets effectively silenced the voices of pro-choice leaders by showing only a small part -- if any -- of their speeches at the Democratic National Convention. In doing so, networks fed the stigma around abortion, which is already prevalent in the media, and thereby contributed to anti-choice misinformation, which can manifest itself in dangerous laws closing abortion clinics and even violence. Fox News ignored Planned Parenthood Action Fund president Cecile Richards’ July 26 speech at the Democratic National Convention entirely, while CNN played a portion of it and MSNBC ran part of the speech in the corner of the screen with commercials over it, so viewers could not hear her words. Fox also ignored NARAL Pro-Choice America president Ilyse Hogue’s July 27 speech at the convention, while CNN and MSNBC showed convention scenes while she was speaking during commercials and panel discussions, but included no audio of Hogue’s speech and did not indicate that Hogue was speaking. Media have pointed out that the speeches were both groundbreaking. Richards was the first speaker to mention the word “abortion” on the convention stage so far this year. Hogue “broke new ground,” according to Yahoo News, by discussing her decision to have an abortion. Networks’ reluctance to air the speeches feeds into existing abortion stigma, which can be defined as “a shared understanding that abortion is morally wrong and/or socially unacceptable.” One of the main manifestations of abortion stigma is “personal and cultural silence around abortion.” Silencing those who publicly discuss abortion or share their own abortion stories is a way of feeding that stigma. Media are no strangers to abortion stigma, which can take many forms in the news, including use of misleading b-roll footage of babies during news segments about abortion. Media figures also reinforce the idea that abortion is a risky and cruel procedure by parroting conservative talking points while discussing anti-choice regulations on abortion clinics. Hollywood is also guilty of feeding stigma about abortion, by not treating it like the “routine medical procedure” that it is. Abortion stigma’s prevalence in the media can be extremely dangerous because it leaves room for misinformation about the procedure, which is all too common. Lawmakers have adopted abortion myths and misinformation to promote anti-choice legislation and TRAP (targeted regulation of abortion providers) laws, and these mistaken concepts even made their way to the Supreme Court. Even more dangerously, some anti-choice extremists use misinformation surrounding abortion to justify violence against providers. A series of videos attacking Planned Parenthood by the anti-choice group the Center for Medical Progress precipitated a ninefold increase in anti-choice violence. Abortion stigma is dangerous to women. By silencing the voices of pro-choice leaders, media are complicit. On Tuesday night, Planned Parenthood Action Fund president Cecile Richards addressed the Democratic National Convention in a speech that CSPAN was the only cable network to air in full. Richards was also the first speaker at the convention to use the word "abortion" on stage. Vox’s Emily Crockett pointed out that reproductive rights advocates in recent years have pushed to de-stigmatize abortion, a campaign that involves encouraging people to publicly talk about a procedure -- including by naming it -- that one in three U.S. women will have in her lifetime. It might seem strange that Democrats, most of whom are pro-choice and willing to speak out against things like Planned Parenthood funding cuts, are often so reluctant to actually use the word "abortion." But it’s very common for Democrats and other pro-choice advocates to instead use euphemisms like "a woman’s right to choose." There’s also a tendency to implicitly apologize for abortion by emphasizing that federal funds for Planned Parenthood don’t go toward abortion, or to focus only [on] how great the organization's contraception and sexual health services are. In recent years especially, pro-choice advocates have pushed to fight the stigma against abortion in order to protect it as a fundamental right. They say that about one in three women will have an abortion in her lifetime, and many people don’t realize that abortion is a safe, routine medical procedure. Abortion should be treated like the normal medical care it is, advocates say, not separated out and turned into a political football. And they say that saying the word "abortion" like it’s a normal thing is one way to break the stigma and accomplish that goal. On MSNBC's Maddow, Planned Parenthood's Richards Praises "The Strongest Reproductive Rights Ticket We've Ever Had"
Conservative blogger Erick Erickson likened Planned Parenthood president Cecile Richards to a notorious Nazi doctor, calling her "America's own version of Josef Mengele" and labeling Planned Parenthood a "mass murdering organization." Conservative media figures have used deceptively edited videos, alleging that Planned Parenthood was involved in the sale of fetal tissue, released by the anti-choice Center for Medical Progress to compare the women's health organization to Nazis. Erickson previously referred to Richards as "the closest we have come in America to Josef Mengele" and has equated abortion with the Holocaust. At a time more and more open white supremacists are backing Donald Trump, America's own version of Josef Mengele, Cecile Richards, is praising Donald Trump's defense of her mass murdering organization. 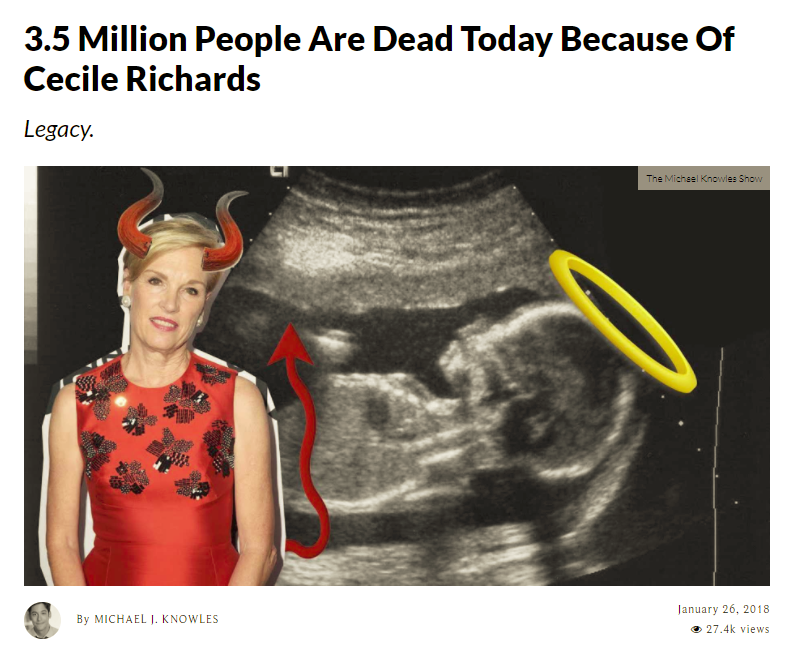 Richards presides over Planned Parenthood, which chops up children and harvests their body parts for sale, including storing whole children in freezers for later sale. Millions of children have died at the hands of Cecile Richards' organization and Donald Trump calls her organization "wonderful." Media Fact Checkers: Chart "Makes Absolutely No Sense" And "Has No Y-Axis"
Right-wing media have spent months promoting a deceptive data chart from the anti-choice Americans United for Life that on September 29 became the cornerstone of Rep. Jason Chaffetz's (R-UT) cross-examination of Planned Parenthood President Cecile Richards at a House Oversight Committee hearing aimed at defunding the organization. The chart's data is out of proportion and neglects to document numerous services performed by the women's health care provider to make it appear as if most of what Planned Parenthood does is pregnancy terminations. Fox Host Falsely Suggests Debunked Smear Videos Show Planned Parenthood "Appearing To Haggle Over Fetal Body Parts"
Breitbart News compared Planned Parenthood to Nazis, writing that the organization's president, Cecile Richards, "is well on her way to personally matching Hitler's body count." In the wake of the release of a series of deceptively-edited videos from anti-choice group The Center for Medical Progress (CMP) -- all of which have been consistently debunked and called-out by the media for showing no evidence that Planned Parenthood broke any laws in obtaining fetal tissue donations from consenting patients -- right-wing media were quick to compare the health care provider to Nazis. 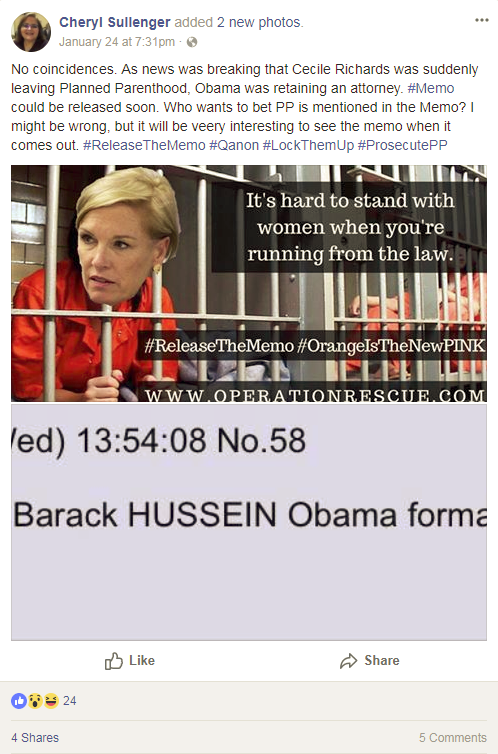 Planned Parenthood can attribute a good portion of their boffo baby-killing business to their president since 2006, Cecile Richards. Richards is well on her way to personally matching Hitler's body count. Breitbart has done the grim maths so you don't have to. Using a conservative estimate of 300,000 abortions a year -- or 300 kiloscrapes, using the technical metric measure -- Cecile Richards has presided over three million abortions, or three megascrapes in her ten years as president of the organisation. This has earned her "half Holocaust" status. Full Holocaust seems eminently reachable given Planned Parenthood's growing hegemony in the abortion industry. But under Richards the numbers have skyrocketed such that in just the last ten years, at least 3 million young lives were ended. If Cecile stays in her post another decade, she will reach "full Hitler," by matching the six million deaths of the Holocaust. In fact it'll probably be sooner than that, given the acceleration during her reign. There are many comparisons to be made here. Some of the revelations coming out about Planned Parenthood remind us of the ghoulish experiments of Dr. Mengele and the odious Unit 731 in Japan, both of which performed terrible tests on living subjects in the name of furthering medical science. On June 30th, five male justices held that "closely held" for-profit secular corporations like Hobby Lobby are exempt under the Religious Freedom Restoration Act (RFRA) from the so-called "contraception mandate." Right-wing media predictably cheered and mocked women's access to contraception, even though the decision was based on a series of myths.